Investment bank Morgan Stanley believes Apple will partner up with both China Telecom and China Mobile "over the next year" to make its iPhone available on all three Chinese carriers, a move that could bring incremental sales of as many as 40 million units next calendar year. Analyst Katy Huberty issued a note to investors late Sunday noting the vast untapped potential for the iPhone in China. According to her, Apple can only possibly reach 10 percent of the 150 million "high-end Chinese subscribers" in the country through its current partnership with China Unicom. China Mobile, the world's largest wireless carrier, holds the bulk of the country's high-end subscribers with an estimated 120 million customers who pay more than 100RMB ($16) a month. 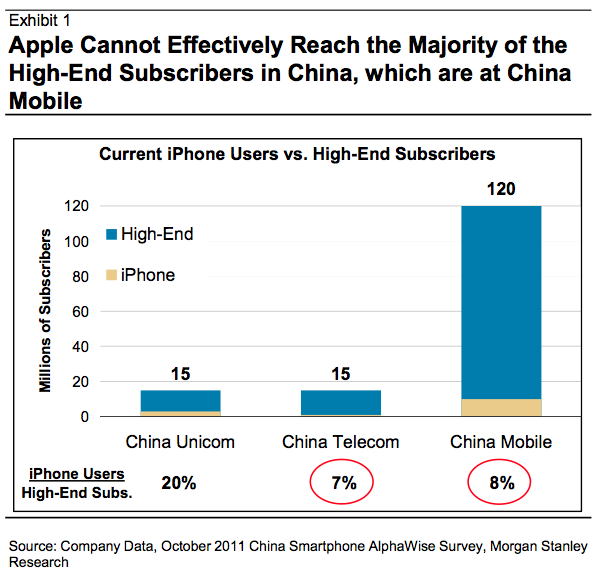 The final 10 percent of high-end subscribers are on China Telecom, the third-largest carrier in China. Huberty sees a base case of 26 million incremental iPhone sales in China during the 2013 calendar year with the addition of China Mobile and China Telecom. Her bull case suggests 40 million units for an increase of $10 in earnings per share. According to the analyst, Apple's sixth-generation iPhone is "likely to be compatible" with China Mobile's upcoming 4G TD-LTE network. She qualified that it is "still too early to know for sure," while restating the firm's belief that the next-generation iPhone will take advantage of a quad-mode baseband chip from Qualcomm. 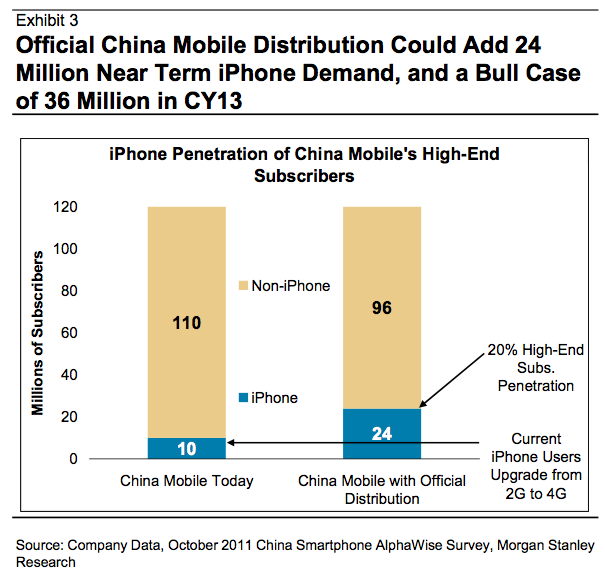 Morgan Stanley expects the next-generation iPhone to arrive in the third quarter of 2012 and a China Mobile iPhone launch to occur in late 2012 or early 2013. Assuming similar 20 percent penetration of China Mobile's subscribers as Apple has reached with China Unicom, the iPhone maker would sell 24 million handsets on China Mobile alone next year. However, given that 3G and smartphone penetration in China is "increasing at a fast clip." she believes Apple could sell as many as 36 million units on China Mobile in 2013. Huberty expects the iPhone to arrive on China Telecom sooner than China Mobile. Citing recent regulatory approvals, checks in Asia and comments from Apple CEO Tim Cook on last week's quarterly earnings conference call, the firm voiced its belief that the carrier will start distributing the iPhone "in the next few months." The investment bank's analysis suggests that Apple could add between two to four million iPhones in sales from China Telecom next year. As of last October, China Mobile had 10 million iPhones on its network, despite the fact that it does not officially sell the device and users are limited to slower 2G service because of compatibility issues. Worldwide, Apple continues to have strong potential for iPhone growth with just 30 percent penetration of global carriers. By comparison, BlackBerry maker Research in Motion has reached 79 percent of the global market. Morgan Stanley's bull case projects 60 million in annual iPhone sales in China "in a few years," assuming a 2-year life cycle and similar market share among high-end subscribers as in the U.S.
A Morgan Stanley survey from last fall revealed that Apple has passed up rival handset maker Nokia to become the top smartphone brand in China. 40 percent of respondents indicated that the iPhone was their first choice for a 3G handset. For its part, Apple indicated last week that iPhone demand in China was "staggering" during the December quarter. Cook indicated that iPhone 4 sales remained strong even as the launch of the iPhone 4S loomed. The arrival of the iPhone 4S in China earlier this month attracted crushing crowds that resulted in the postponement of retail sales of the device at Apple's five official stores in the country. Apple's Chinese online store currently lists all models of the handset as sold out. 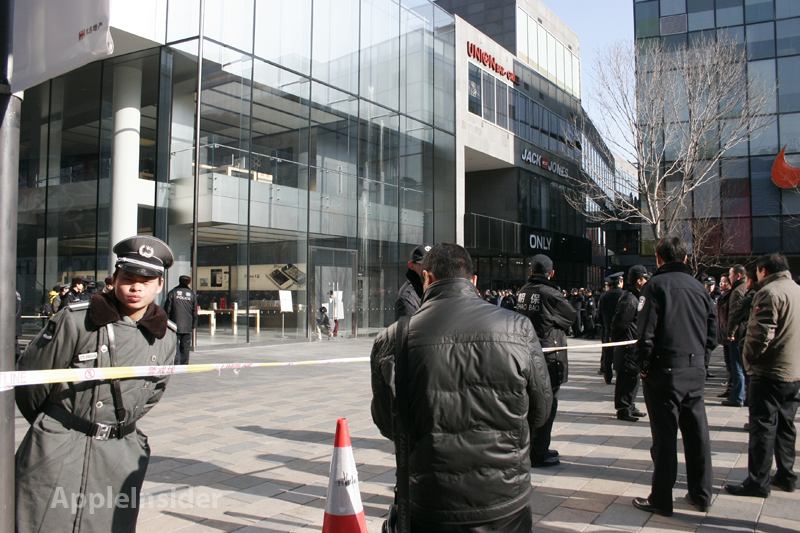 Police officers cordoned off the Sanlitun Apple store in Beijing after line-waiters pelted it with eggs. Apple posted 128 percent year-over-year growth in iPhone sales to reach an all-time high of 37 million units in the December quarter. In the days following Apple's announcement of its quarterly results, Wall Street analysts scrambled to raise their estimates for the second quarter of Apple's fiscal 2012.